Welcome to the Open Design Podcast, a discussion about game design and game mastery with hosts Wolfgang Baur, Ed Healy and Rone Barton. John Wick created Legend of the Five Rings and 7th Sea for Alderac Entertainment Group, winning four Origins awards in the process, before moving on to start Wicked Dead Brewing Company with Jared Sorensen. Last year, John released the long-awaited Houses of the Blooded, which sold out in under a week. He’s a brilliant designer and he agreed to share some wisdom with us. John’s Open Design credits include the Wicked Fantasy series – articles about classic fantasy races, but with a twist. 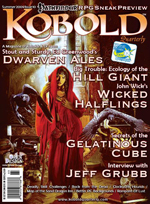 The first installment is in the recently released Kobold Quarterly Issue #10. Also Mentioned: Orkworld (Wicked Press), Greg Stafford, Houses of the Blooded (Wicked Dead Brewing Company), John Tynes, NeonCon, octaNe (from memento mori theatricks), Kenneth Hite, Curse of the Yellow Sign, Act I: Digging for a Dead God (Wicked Dead Brewing Company), RPG Countdown, My Monster (Wicked Dead Brewing Company). Dan Voyce has been a patron on numerous Open Design projects, including Wrath of the River King, Tales of Zobeck, and both editions of Halls of the Mountain King. We asked him to come on and talk about patronage, and his journey from patron to contributing author. To learn more about Open Design, visit Wolfgang Baur’s homepage. Tim and Eileen Connors have been collaborating on adventures and magazine articles for the last three years, first in Dragon and Dungeon magazines, and then for Kobold Quarterly. More recently, they have contributed to various Open Design projects, including the Tales of Zobeck anthology. We spoke with them about their work, and about working together. The Connors’s Open Design credits include Halls of the Mountain King, ‘Belphegor, the Baron of Laziness and Invention’ (Kobold Quarterly Issue #2), Tales of Zobeck, ‘Adriel, Angel of Hope’ (Kobold Quarterly Issue #4), ‘Secret Messages’ (Kobold Quarterly Issue #6), ‘Horrors from the 5th Dimension’ (Kobold Quarterly Issue #8), and numerous articles on the Kobold Quarterly website. Also Mentioned: ‘Siege of the Spider Eaters’ (Dungeon Magazine Issue #137), Kobold Quarterly 008 (Atomic Array 015). If you enjoyed this episode, consider subscribing so that you’ll be notified when the next one is released. 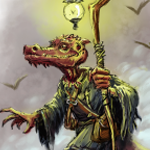 Feel free to drop by the Kobold Quarterly forums to tell us what you think as well. I ABSOLUTELY HATE KINDER AS WELL. Thank you! What I love about Wick is that he does have things he hates, and he’s not afraid to say so. He makes design choices and sticks with them. It’s sort of the opposite of the “kitchen sink”, all-fantasy-elements-are-created-equal design approach of some settings. So its out huh? My embarrassment knows no bounds! (Fortunately everyone at ODP was great and very indulgent of this fumbling amateur…) Its great stuff! John Wick was a highpoint, as everything he touches is gold for me. Also nice to finally hear Tim in person after all the email back and forth. The audio is hurting my ears. What’s up with the hissing and static? I heard it clear and clean. I’m only part way through this, but a couple of comments. First, saying the halfen (sp?) are cool is good and what not, but what is it about them that makes them cool? Before I buy the mag, I’d like to know a bit about the content. Just a summary version would be great. And as a Dragonlance fan, it seems obvious to me that John doesn’t get kender. They aren’t kleptomaniacs so much as they are extremely curious. They’re the “children of the world.” But alas, most people give kender a bad rap when it’s the players who abuse the race who should have the bad rap. John is a man of strong opinions, it’s true. The Haffun are cool because Wick reinvents the halflings as mysterious servants. Everyone needs a haffun around the house; this gives them powers of stealth, gifting, and more of an alignment with the way that halflings are often played in practice, rather than the idealized Hobbits of AD&D. A rationale to be so shifty, and another axis for roleplaying supported by mechanics. I can respect John’s strong opinions. I may not agree with them all the time, but such is the nature of the universe. I actually am curious to see how he might redefine the other races. Sorry hiss and static is not a good description. Wolfgang and Rone’s voices are mic’ed poorly. They are blown out. You need to adjust the gain or something. It sounds really bad. Ed’s voice is mostly in the right range. Just constructive criticism. Maybe I just have sensitive hearing but it makes it difficult to listen to the entire podcast straight through. I need to pause every once in a while.